The Hot Box v2 is the latest revision of Remote Audio’s popular DC power distribution box, and the newest member of the MEON series of power management devices. 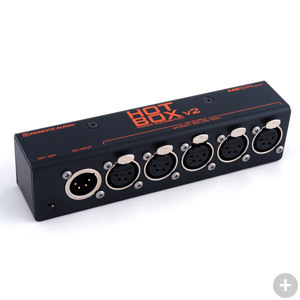 Like its “Hot Box” predecessor, the Hot Box v2 features 6A self-resetting breakers on each of its XLR4F output connectors and a master on/off switch. Maximum current handling capability is 24A for the entire box. Hot Box v2 adds reverse-polarity protection and a much smaller physical footprint with all connectors entering and exiting on the same side of the unit. It is simple to mount in a cart. The Hot Box v2 has a 4-pin XLR input, wired in the standard configuration of PIN 4 +, PIN 1 -. Input voltage should fall within a range of 6 – 20V to ensure correct operation. The Hot Box v2 is protected from reverse-polarity at the input. The illuminated power switch will stay off, and no voltage will be passed to the output connectors. There are five DC power outlets on the Hot Box v2, also wired in the standard 4-pin XLR configuration. These outlets have auto-resetting 6A breakers to protect against overload. The Hot Box v2 can be mounted inside the cart or bag with Velcro® strips or any other suitable type of fastening device. The Shunt Box is the perfect companion to the Hot Box v2. It offers enhanced power management options, including its own redundant overload protection, reverse polarity protection with flashing indicator, and RM Remote Meter interfacing for voltage & current monitoring and remote power cycling. The Shunt Box can be placed in-line before the input to the Hot Box v2 to monitor the total voltage and current consumption of all devices connected and to remotely turn on/off the system. It could also be placed in-line with a single device to remotely monitor and turn on/off that device. With the Hot Box v2 hidden deep inside the cart, the Shunt Box and RM Remote Meter become the brains of your power management system.